Dr. Andrefsky and student in lab. 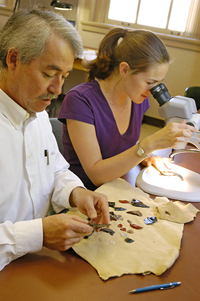 The Anthropology Department has dedicated a suite of rooms for lithic analytical studies. 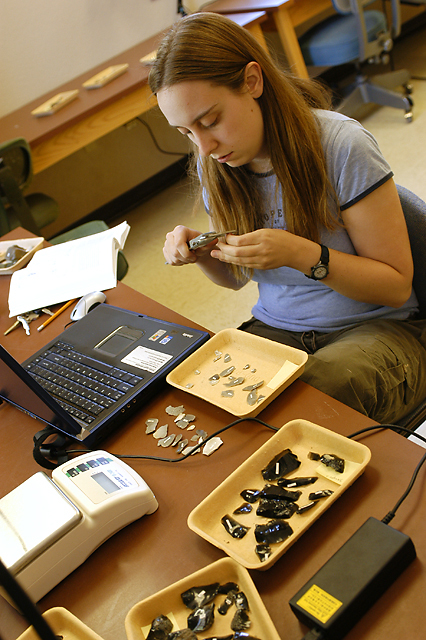 The lithics laboratories include layout and storage rooms where stone tools and debitage can be handled and measured by students and researchers. These labs are equipped with electronic scales, calipers, microscopes, and computer stations. There is also dedicated space for heat treatment of stone and for conducting controlled replication experiments. The replication labs contain locker spaces for holding student personal equipment and experimental collections, a clean replication area, diamond saws, rock grinders, and high capacity ovens. The campus also contains a small nuclear reactor to conduct geochemical studies (neutron activation) and we have access to an electron microscope for high magnification microscopy. Please note – Due to Dr. Andrefsky’s current appointment as Dean of the Graduate School the Lithics Lab is not currently active at this time.